Historic Deerfield, Allen House; In winter. 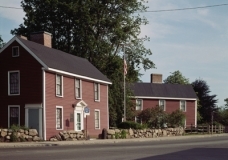 One of Historic Deerfield's "Street" of early Massachusetts Houses. 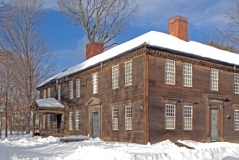 Historic Deerfield, Ashley House; In winter. 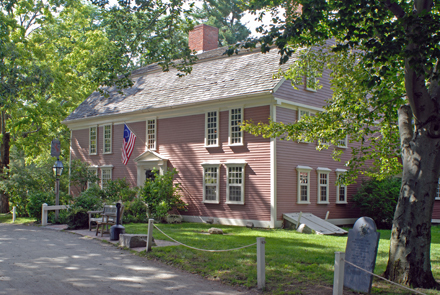 One of Historic Deerfield's "Street" of early Massachusetts Houses. 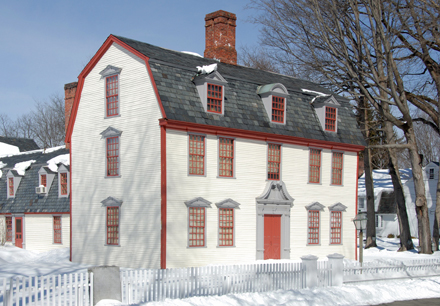 Interesting gambrel roof twin-chimney with elaborate broken-scroll pediment front door entablature. Historic Deerfield, Barnard Tavern and Frary House; In snow. 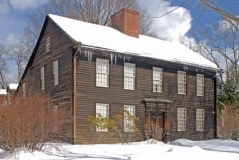 On Historic Deerfield's "Street" of early Massachusetts Houses. Double house with different door entablatures and modillioned cornice. 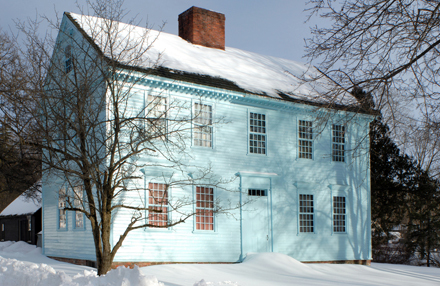 Historic Deerfield, Dwight House (c1754); In snow. 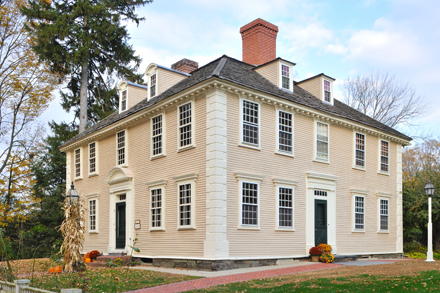 On Historic Deerfield's "Street" of early Massachusetts houses. Moved from Springfield. A small gem of Georgian decorative elements on a narrow gambrel roof house. 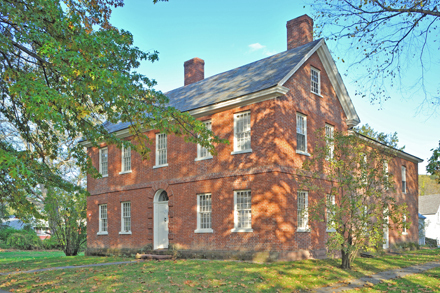 Historic Deerfield, Stebbins House (1799). On Historic Deerfield's "Street" of early Massachusetts houses. Brick "Federal". Arched door with brick surround. Belt course. 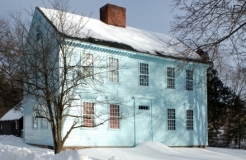 Historic Deerfield, Stebbins House (1799); In snow. 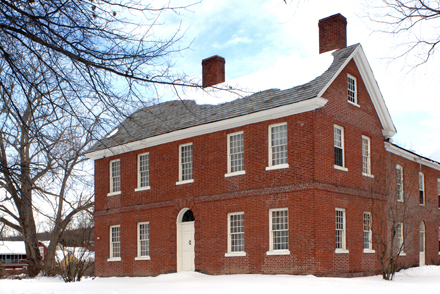 Historic Deerfield, Wells-Thorn House (1746-47); In snow. On Historic Deerfield's "Street" of early Massachusetts houses. Plain center-chimney farm house. 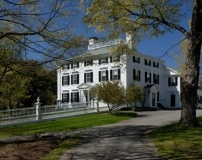 The Manse (c 1770), Deerfield Academy Headmaster's House; West and South facades in fall. On "The Street" in Historic Deerfield, but not part of the museum. Elegant Georgian with hipped roof, quoins, segmental pediment over west door, modillioned cornice. The Manse (c 1770), Deerfield Academy Headmaster's House; West and South facades in snow. Adams Salt Boxes (late 17th or early 18th century), Quincy, Massachusetts. 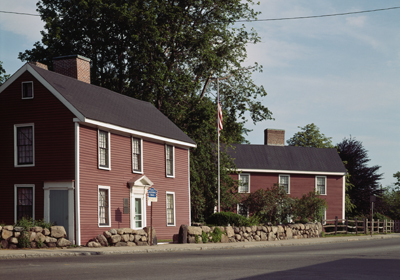 Here we see the birthplaces of two American presidents: John Adams and John Quincy Adams. 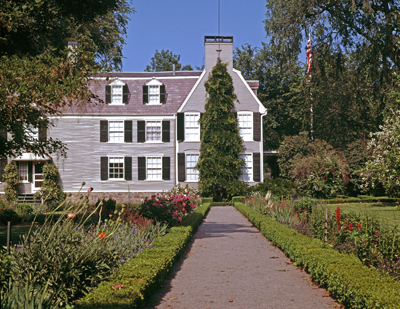 Adams Mansion (1731), Quincy, Massachusetts; View looking north from garden. 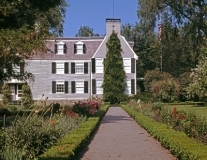 Purchased by John Adams (later second president of the United States) in 1788, and extensively renovated by him and his son John Quincy Adams (sixth president of the United States). 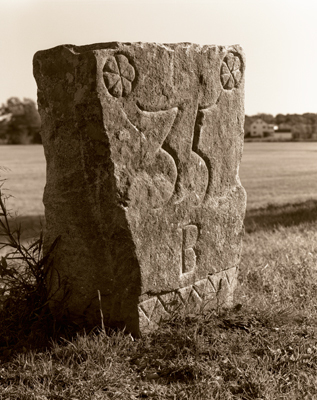 Boston 35 Mile Marker (1732), Newbury, Massachusetts. Best preserved of a number of mileage markers in Newbury. Charmingly decorated.Black and white photograph. 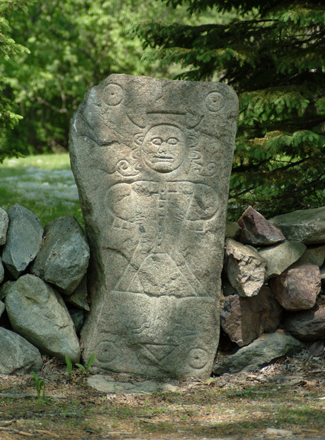 "Witchstone" (1723), Newbury, Massachusetts. 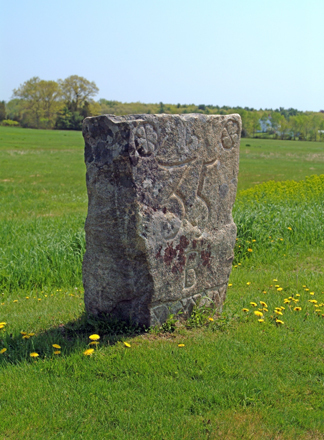 Actually a walkway stone (also called the "Father's Stone"), the whimsical carved figure is said to be that of Richard Dummer, Jr.
Boston 35 Mile Marker (1732), Newbury, Massachusetts. Best preserved of a number of mileage markers in Newbury. Charmingly decorated. Color photograph in spring. Meriam's Corner Farm House, Concord, Massachusetts; In spring. 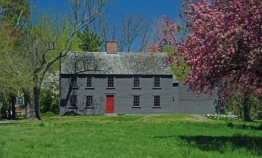 18th century farm house at site where battle of British retreat from Concord began April 19, 1775. 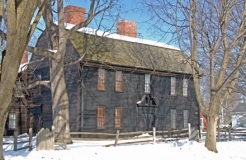 Jabez Wilder House (said to date from 1690), Hingham, Massachusetts. 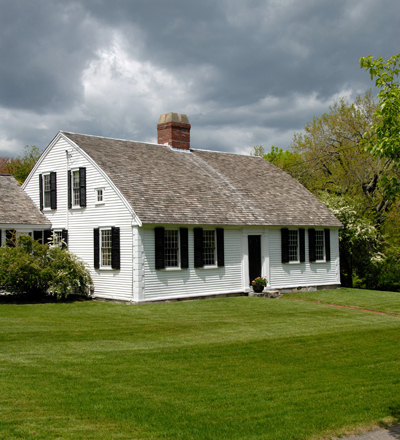 Typical "Cape Cod House" except for unusual bowed or "rainbow" roof. 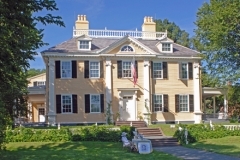 Winslow Crocker House (c 1780), Yarmouth Port, Massachusetts. Large, two story Cape colonial with center chimney. Angular pediment over front door. 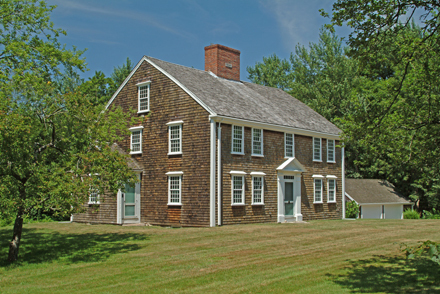 Kittredge Farm (1784), North Andover, Massachusetts. Elegant late Georgian mansion with portico, balustrade. 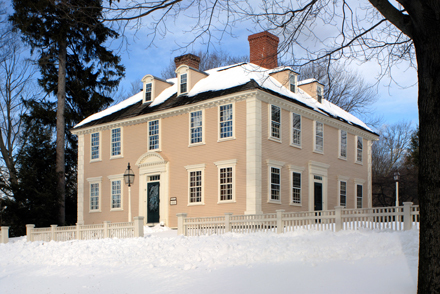 Longfellow (Vassall) House (1759), Cambridge, Massachusetts. 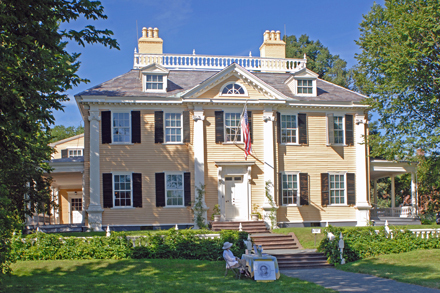 Built by Loyalist John Vassall, occupied by General Washington during the siege of Boston, home of poet Henry Wadsworth Longfellow. 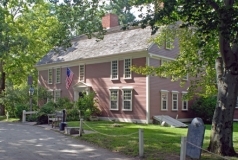 Longfellow's Wayside Inn (late 17th-early 18th century), Sudbury, Massachusetts.Wood clapboard, angular pediment, window hoods. A substantial colonial Georgian wood frame house.